What (or who) is TASBot? TASBot is best described as a special R.O.B. robot outfitted with Legos to hold a custom circuit board that can exactly mimic the behavior of a video game controller. TASBot can play games on real video game consoles with superhuman abilities, usually leading to game breaking glitches in front of live audiences. TASBot has a long and storied history that starts with the initial efforts to replay Tool-Assisted Speedruns on physical hardware via a process now called console verification. TASBot was born on 2013-12-22 and is currently hosted by his creator and keeper, dwangoAC. He is on Twitter as @MrTASBot, TASBot.net (which redirects to this page), and on Freenode IRC in #tasbot. He has made appearances at AGDQ 2014, AGDQ 2015, SGDQ 2015, AGDQ 2016, SGDQ 2016, and AGDQ 2017 (although the earliest TAS involvement at a GDQ event was organized by DarkKobold during SGDQ 2011). TASBot has also participated in talks at TWiT's The New Screen Savers episode 60, DEF CON 24, and GeekPwn 2016. 11-20: Morimoto creates the first widely distributed Tool-Assisted Speedrun (TAS), labeled as a Time Attack of SMB3. 11-26: Bisqwit discovers a .WMV of Morimoto's SMB3 time attack, eventually leading him to create the website that became TASVideos.org. 08-07: Ash Williams comes up with the concept for a "tas-bot" AI that learns how to play games which later turns into a 2012-12-29 Github project by the same name similar to the more recent MarI/O project. 08-27: Myria starts a discussion thread on the feasibility of playing back Tool-Assisted Speedruns on real hardware. 10-20: true suggests "With typical frame-by-frame input, if the emulator is accurate, a movie could possibly be replayed on a real console." 10-14: true creates the first working controller interface using a PIC microcontroller which he uses to perform initial controller emulation testing on an NES. 11-02: Jaku creates a BS2 based replay device and successfully plays back prerecorded input of SMB1, completing the first level. 07-16: micro500 announces an NES replay device named NESBot. 02-10: micro500 creates an Instructables guide to build an NESBot using an Arduino Duemilanove microcontroller and a breadboard along with the first complete console verification run in the form of SMB. 02-11: DarkKobold suggests creating an icon and a special Verified category for all movies that have been replayed on a console (which adelikat refers to as "machine verified" at the time). 07-07: DarkKobold presents an NESBot demonstration at Summer Games Done Quick 2011, playing back SMB2 (Archive.org encode) and Wizards And Warriors 3 (Archive.org encode) in front of ~1,500 viewers. 11-12: SoulCal announces a TI MSP430-based N64 bot named Droid64 that verifies SM64 0-stars and 120 stars. 03-01: micro500 creates a Parallax Propeller-based N64 bot that also verifies SM64 0-stars. 03-20: GhostSonic creates an Arduino-based SNES replay device that verifies SMAS and other SNES games. 04-13: GhostSonic posts a verification of Sonic the Hedgehog using his Arduino-based replay device adapted to work on a Genesis, marking the first non-Nintendo platform. 05-18: GhostSonic further adapts his Arduino-based replay device to function with an SNES and verifies Masterjun's SMW game end glitch. 08-22: dwangoAC offers to present a TAS demonstration for AGDQ 2014, pitching Gradius, SM64 and other games. The same day, Mecha Richter leaves the comment "I second having TASbot play Gradius so hard!!!" in the SDA forums marking the first time the term TASBot is used in the context of replay devices (outside of the TASVideos forums). 10-04: true completes the initial prototypes of his standalone NES / SNES Replay Device. 12-22: dwangoAC attaches a Raspberry Pi and one of true's prototype boards to a R.O.B. and dubs it "ROBBerry Pi", marking the first time a R.O.B. robot is used in conjunction with console verification. 01-05: dwangoAC, micro500, and weatherton present at AGDQ 2014.
dwangoAC demonstrates Gradius by adelikat (but it desyncs). weatherton and micro500 present a MK64 demonstration. micro500 and weatherton present a SM64 0-Star run (which beat out SMB3 with a $0.25 bid war donation margin). dwangoAC demonstrates Gradius again with commentary from adelikat via Skype but the game desyncs a second time, likely due to interference from the cart acting like an RF antenna as well as microphone cables draped over the controller cables. dwangoAC and micro500 present SMW Pong and Snake by Masterjun with couch commentary from TheGreekBrit. Chat volume increases to its highest point of the day during the SMW presentation (http://i.imgur.com/87BucJE.png). During the SMW presentation, Tommy Refenes of Super Meat Boy fame makes a $500 donation with the comment "I'm loving this TASbot! Great work everyone!" A Twitter post from GDQ reads "Want to buy a TAS Bot? Check it out here! http://truecontrol.org/". 01-10: Adam Fabio from HackADay publishes an article titled "Teaching Mario to Play Pong and Snake Through Innumerable Exploits". 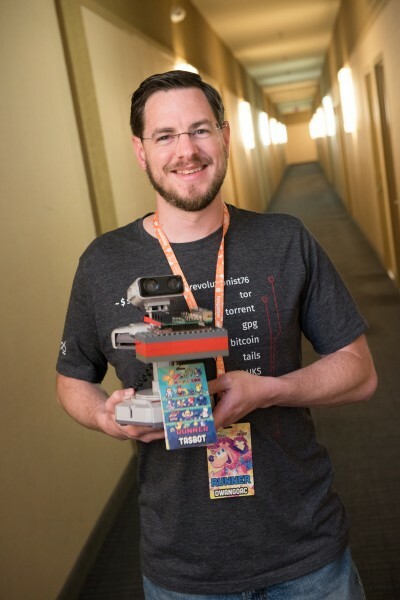 01-12: dwangoAC presents a bonus stream at AGDQ 2014 and demonstrates Legend of Zelda, Zelda II (not fully broadcast due to stream crash), Tetris "999999", Tetris Mode B, Tetris Playaround, and Dr. Mario. 01-14: Sebastian Anthony from ExtremeTech publishes an article titled "Super Mario World speedrun hack takes up up down down left right left right B A to the next level". 01-14: Kyle Orland from Ars Technica publishes an article titled ""How an emulator-fueled robot reprogrammed Super Mario World on the fly" which increases attention to TASVideos.org. 01-04: dwangoAC, micro500, and Weatherton present at AGDQ 2015. Weatherton and micro500 demonstrate a MK64 Choco Mountain race between Flippy_O, rwhitegoose, Weatherton, and imperfectclark. dwangoAC and micro500 demonstrate SMB on SMW made by p4plus2 using true's MultiReplay device. dwangoAC and micro500 demonstrate Pokemon Plays Twitch made by p4plus2 using true's original NES/SNES replay device employing a movie file made by dwangoAC and Masterjun and Python scripts developed by TheAxeMan, ais523, twm, micro500 and others. Kyle Orland from Ars Technica publishes an article titled "Pokémon plays Twitch: How a robot got IRC running on an unmodified SNES". Nach posts a speedrun of SMB on SMW using a variant with SMAS sound effects. 08-01: dwangoAC and endrift present at SGDQ 2015, eliciting a $5K donation from Notch and leading to Mothrayas winning the Streemerz speed TAS competition. 08-02: The term "TASBot" trends on Google for a third time, showing a clear spike in searches coinciding with each GDQ event. 08-04: Combining data from various sources shows the TAS presentations during SGDQ 2015 helped raise over $35k for charity, bringing the total raised to just shy of $100k between all GDQ-related events. 01-10: dwangoAC, micro500, and Weatherton present at AGDQ 2016. Weatherton demonstrates a Mario Kart 64 race. dwangoAC hosts a competition between live players and pre-made TASs of Pwn Adventure Z.
dwangoAC shows of a TAS of Zelda II. micro500 shows a TAS of Brain Age on a real Nintendo DS he hooked up to a screen, which includes user submitted images from our members, and some live Twitch Chat. dwangoAC shows of a TAS of Super Mario Bros 3..
p4plus2 shows off a TAS of Super Mario World which turns the game into a level editor. 01-11: Kyle Orland from Ars Technica publishes an article titled ""How a game-playing robot coded “Super Mario Maker” onto an SNES—live on stage" which increases attention to TASVideos.org. 07-09: dwangoAC presents at SGDQ 2016. 07-12: Kyle Orland from Ars Technica publishes an article titled ""How to beat Super Mario Bros. 3 in less than a second". TODO: Add more details to the timeline including SVLUG / DEF CON 24 / NBLUG / GeekPwn 2016 and other appearances. 01-14: dwangoAC, micro500, p4plus2, Tompa and others on the TASBot team present at AGDQ 2017. 01-14: Kyle Orland from Ars Technica publishes an article titled ""How a robot got Super Mario 64 and Portal “running” on an SNES". TASBot as a "person" has become something far larger than I ever imagined. There's fanfic out there about @GDQMonitor (apparently a girl) and @MrTASBot having an ongoing relationship. The SDA community seems to refer to TASBot about the same way the Nico Nico Douga community references TAS-san (TASさん, known as "Mr. TAS"). I know true has never particularly felt comfortable with calling his board "TASBot" and at this point I think the name transcends any particular replay device. I've come to think of TASBot as the combination of ROB holding a controller or board and participating in his favorite pastime, playing games perfectly in front of a TV and a loving audience. What could be better?